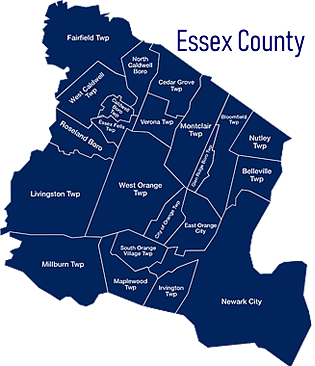 Essex County is a county in the northeastern part of New Jersey. The county's population is 808,285, making it the state's third-most populous county. The county has an area of 129.631 square miles. The wide area of Eastern Essex has significant pockets of high population, high building density and high poverty. In contrast, Western Essex tends to be more suburban and affluent. Within this region are some of the most diverse and racially integrated municipalities in the state and nation, including Montclair, West Orange, South Orange and Maplewood. The communities of Livingston, West Caldwell, South Orange, Maplewood, Millburn, Short Hills, North Caldwell, Roseland, and Essex Fells are some of the wealthiest towns in the county. Short Hills has a popular upscale shopping mall, The Mall at Short Hills located near affluent communities in Morris and Union counties. While many residents commute to New York City, Organon International, Anheuser-Busch, Automatic Data Processing, CIT Group, Hoffmann-La Roche, W. W. Grainger, Dun & Bradstreet and Prudential have large facilities in Essex County or are headquartered there, and there are numerous factories and large office parks scattered throughout. There are many buses that operate around the county, with NJ Transit (NJT) headquarters located just behind Newark Penn Station, a transit hub in the eastern part of the county. NJ Transit has five lines that make stops in the county. All of them stop at either Newark Penn Station or Newark Broad Street Station. The Northeast Corridor Line from Trenton with connections from Philadelphia's 30th Street Station, Camden, and Princeton has stops at Newark Airport and Newark Penn Stations before continuing to Secaucus Junction and New York Penn Station. The Montclair-Boonton Line from Hackettstown or Little Falls has six stations in Montclair, one in Glen Ridge, and two in Bloomfield before reaching Newark Broad Street Station and continuing to Secaucus Junction and New York Penn Station or Hoboken Terminal. The Morris and Essex Lines from Hackettstown and Peapack-Gladstone has two stops in Millburn, one in Maplewood, and two each in South Orange, Orange and East Orange before reaching Newark Broad Street and continuing to Secaucus Junction and New York Penn Station or Hoboken Terminal. Newark Liberty International Airport is a major commercial airport located in the southeast section of the county in Newark and Elizabeth in Union County. It is one of the New York Metropolitan airports. It is a hub for United Airlines. Housing options in Essex County range from Single Family Homes, Condos and Townhouses in towns, to apartment and condo and townhome rentals. You have choices from intimate, seven-unit renovated Victorian buildings to Multi-unit development with amenities such as a club house, swimming pool and tennis courts or perhaps something in between. Our team cover parts of Essex County Real Estate, including towns like Livingston, Millburn, Short Hills, and Roseland.